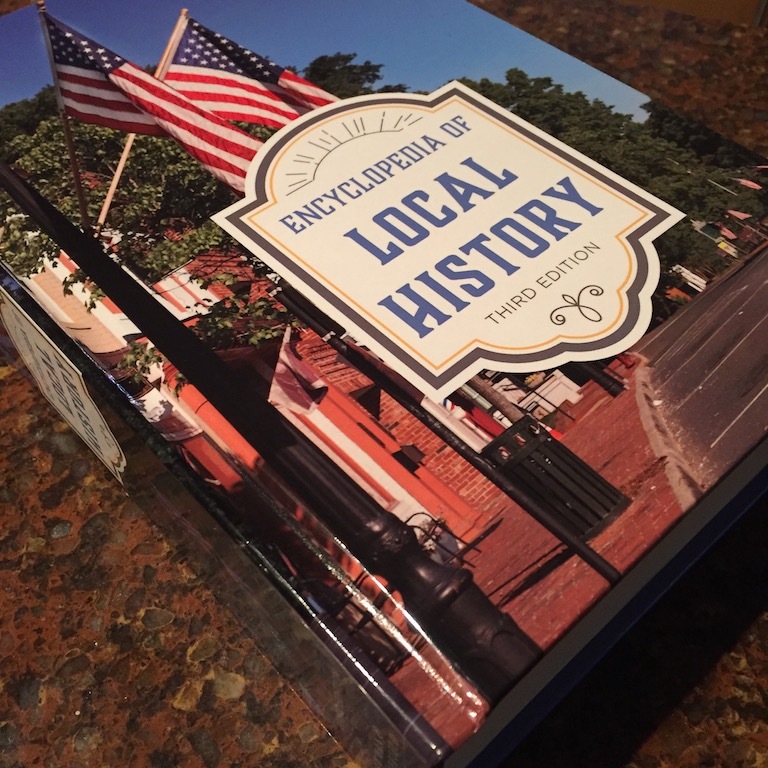 The latest edition of the Encyclopedia of Local History just arrived with a thud on my doorstep. Weighing nearly three pounds and two inches think, it’s a small beast. I served on the advisory board, suggested writers, and contributed entries and photographs, but didn’t realize what a hefty book it would become until a copy arrived at my door. At 800 pages, the third edition added another 150 pages to the second edition of 2013, so if this keeps up, the fourth edition will need a handle. Edited by Amy Wilson, the Encyclopedia is a wide-ranging assortment of definitions, topics, organizations, primary sources, historical approaches, and individual state histories, along with appendices on studying various ethnic groups and religion, and contact information for state historical societies and National Archives facilities. Certainly it’s a reference tool for “local history” jargon that you might be able to find online (what is “historical thinking” or “repatriation” or “Soundex”?) but it also contains mini-articles on provocative subjects (such as “Building Bridges through Local History” by George McDaniel, “Local Historical Societies and Core Purpose” by Anne Ackerson, or “Museums and Families” by Linda Norris). The contributors are among the best people in our field, so the information is solid. You’ll not only want to use it to look up a term occasionally but to let it open to a random page to explore the many aspects of local history (Cyndi’s list? fakelore? social purity? Tweedsmuir History Prize?). At $145, it’s not a book everyone can afford, but it would be great addition to a reference library of a historical society or local public library. This entry was posted in Books and articles, Resources and tagged Amy H. Wilson, Anne Ackerson, Encyclopedia of Local History, George McDaniel, Linda Norris on February 22, 2017 by Max van Balgooy. What century is this? How do projects like this happen. Who underwrites such stuff. This sounds utterly preposterous. Between Google, wikipeadia, 1001 blogs and FB communities related to local history – there is no need for something “authoritative” even if it didn’t weigh 3 pounds. I can see the sense of gathering everything in one place, so you don’t have to search Google, Wikipedia, 1001 blogs, etc. But how about an eBook version? Surely that would be easier to search. And you wouldn’t need reinforced shelving to store it. Ummm…you think reference works – compilations/compendia of knowledge/information aren’t useful. OK–that’s you. I’m sure that my time might be worth $145 rather than googling and sifting through dubious wikipedia entries and inaccessible FB pages. There is still a place for _authoritative_ works–whether online or (gasp) paper. I love (gasp) paper; I publish books for a living. Thanks for the link!